Muhly grasses offer fine foliage textures and stunning flower inflorescences. One cultivar, M. c. 'Regal Mist' has become the choice for residential gardens and commercial landscape due to its reliable yearly flowering performance. This cultivar has foliage that matures around 2 ft. tall and produces a profusion of pink-rose flower panicles growing above the foliage in late summer and fading to wheat color by fall. Regal Mist pink muhly is considered by many people to be the most beautiful flowering grass in our gardens. An easy to grow plant that loves sun, many types of soil, and low amounts of supplemental water. It works well in mass and individual plantings, in containers, parkways and with other flowering perennials. 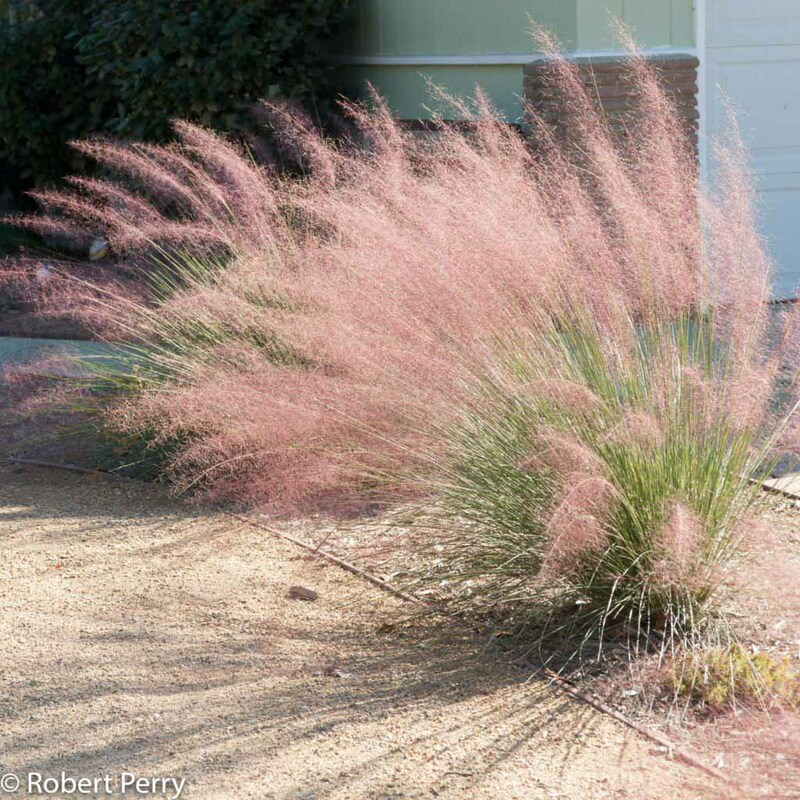 Pink muhly grass is highly adapted to sunny garden locations on well drained soils and with low amounts of supplemental water during summer. The chart shown below provides a recommended baseline guide to the monthly irrigation schedule and volume of supplemental water needed to maintain healthy growth throughout the average year. It should be noted there are several months indicated by an asterisk (*) when winter rains can provide sufficient moisture and irrigation is not needed. The high and low range of moisture indicates it can grow with varying amounts of water; more water in the spring will result in a longer flowering season. Inches per Month 0" to 2" 0" to 2" 0" to 2" 1" to 2" 1" to 2" 1" to 2" 1" to 2" 1" to 2" 1" to 2" 1" to 2" 0" to 2" 0" to 2"
Range of supplemental summer water: 7"-14"
Range of supplemental winter water: 0"-10"
In late winter or early spring, just prior to spring growth, cut back hard, to an appx. 6" mound. For multiple plants, this is best done using a manual or powered hedge trimmer. If needed, dried flowers can be cleaned up over the winter with a very light shearing, but it is a warm season growing grass so avoid cutting back significantly during the cool season. If you only have a few plants, old flower stalks can be removed individually with a hand pruner. After the pink flowers fade to tan, the dried flowers continue to look attractive for quite some time. Consider waiting to remove dried flowers until they begin to look unattractive (S).